That's the thing, especially so far as Pat McCrory is concerned. He's a man without a "values" rudder, always at the beck and call of the rich and powerful who do have core values and who are looking for willing tools to tote their water and fetch their slippers. Pat McCrory is their guy. Always has been. McCrory was first induced to run for the Charlotte City Council by William S. Lee, CEO of Duke Energy back in the 1980s, and once in office, McCrory became Duke Energy's guy, running to their whistle, always willing to put his thumb on the scales for The Big Boys. He would obligingly testify in Congress, after he became mayor of Charlotte and was still working for Duke, against stricter air pollution standards without bothering to mention that he also worked for a major fossil fuel polluter. In a famous NC Supreme Court dissent in Cook v. Charlotte, Justice I. Beverly Lake explicitly mentioned McCrory's toadying for Duke. Lake wrote that McCrory's conflict of interest had been shocking, that he had in effect colluded with Duke Energy and voted to condemn a piece of property that Duke wanted for itself. Puppet? You bet. 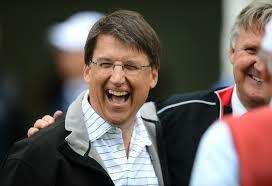 McCrory obviously relishes the lifestyles of the rich and famous, especially when The Big Boys are paying. Then he neglects to report on his financial disclosure forms that he's yucked it up in luxury with the high-rollers, as though it were a shameful thing. Which it is, if you don't know who you are and are totally fixated on who they are, and what they want. The rudderlessness is what has made McCrory a disaster as governor of the state. The Berger-Tillis junta took over the General Assembly two years in advance of McCrory's own election as governor, and McCrory spent those two years slavering Berger-Tillis with sycophantic praise, currying their favor so they'd support him in the 2012 Republican primary. Berger, certainly, saw McCrory for what he was, a willing tool to the powerful who had no core principles himself. Tillis was maybe kinder in his assessment and tried to prop up the governor occasionally, but the Berger abuse of McCrory showed the world how hollow the governor was, and other members of the General Assembly have piled on. They bought him. They own him. They'll treat him like the lap dog he is. Now someone else may have bought him, and North Carolina will veer again in new, dangerous directions. I am a republican, and always will be. I worked hard for the governor. I was wrong to do so. Much of this article I hate to say is correct. I have experienced much of it at the hands of the governor's staff. Not all republicans are worthy of respect, not all democrats are evil. When we realize this and start working together toward a better North Carolina instead of playing "gotcha" politics North Carolina will grow and prosper as never before.